Geek Girls Rule #171 – Feed by Mira Grant – Geek Girls Rule!!! One hell of an awesome book in a genre I'd thought was played out. Feed (Newsflesh, Book 1) by Mira Grant (alter ego of Seanan McGuire) has been nominated for a Hugo Award, and is well deserving of that honor. I downloaded it a couple of weeks ago, but hadn’t had time to really start reading it, until a few days ago, and I’ve been ripping through it, sneaking away to catch a few more pages in between doing whatever else is going on in my life. The next book in this world, Deadline (Newsflesh, Book 2) , comes out May 31st. 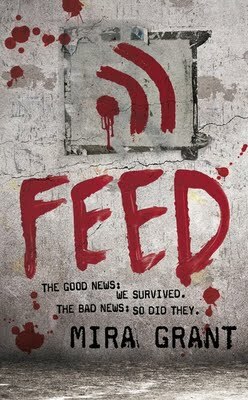 Feed takes place some fifteen years after a zombie apocalypse caused by the release of an untested and contagious cure for the common cold, and its blending with a genetically engineered cure for cancer. When these two genetically engineered contagious cures meet one another, they blend in to the Kellis-Amberlee virus, and the dead begin to rise. Fifteen years later when the story opens, zombies are a way of life, another hazard of modern living, and the world has begun to cope. Brother and sister Shawn and Georgia Mason, part of a new breed of journalist born out of what we recognize as the blogosphere, are tapped to follow the presidential campaign of Senator Peter Ryman. The book, through the POV of Georgia, follows the Mason’s as they follow the campaign. What starts out as a run of the mill campaign season quickly turns bad as misfortune hits the campaign, and then the Senator’s family. The pacing is excellent, and it’s suspenseful as all hell. Frequently, I find myself tensing up as things start to happen. Shawn and Georgia uncover a plot against the Senator, and pursue it with a the dogged determination of true journalists. The descriptions of gore are almost clinical, coming, as they do, from characters who have spent nearly their entire lives dealing with zombies and the reanimated dead as a fact of life. The scenes where what the characters see actually disturbs them, in contrast with the sheer amounts of gore that haven’t fazed them, is an effective contribution to the mood. The characters are interesting and well-rounded. The dialog feels real and like actual conversations. The action is well-paced and well-described. I highly recommend Feed to you guys. Just… there are parts you shouldn’t read when you’re out in public, because Ms. Grant/McGuire is very good and invoking emotional responses, and you will cry. Honestly, one of the reasons I’d put off actually reading Feed was because zombies have been done so much in the past few years, that I didn’t think there was anything new or interesting to do with them. Check out Feed, you won’t be sorry. Consider it got over here. Also, I’m not sure if you found it or not, but I’d highly recommend Charm School, by Elizabeth Watasin. It’s a wonderful, cute, funny book set in a world of monsters and ghouls and all that good stuff, and it’s centered around a witch named Bunny, a vampire named Dean, and Fairer Than, who is part Faiery, human, and dragon. It’s a love triangle type deal and it’s just so nice to read. I think Jilli, the Headmistress of Gothic Charm school, is into that book/series. I’m sure she has it. I’ll give it a shot. Feed was so good. I don’t know quite what I expected, but it exceeded all expectations. I haven’t read it yet, as I got it for my iPod, and I’m saving it for work, where I work alone. A good thing too, since I can cry and try not to puke as I read this. I’ve never been all that good with blood.